Enphase Energy presents the first commercially available Micro-Inverter system for residential and commercial solar PV applications. The Enphase Micro-Inverter system utilizes advanced technologies to maximize energy harvest, increase system reliability and dramatically simplify design, installation and management. The module performance information generated by each Micro-inverter is collected by the Enphase communications gateway called the Energy Management Unit (EMU). 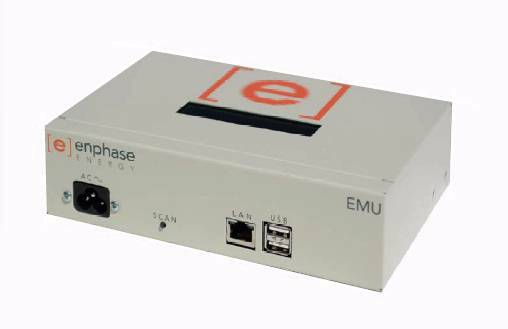 The EMU communicates with the Micro-Inverters through the ac building wiring system and then transmits the collected data over a broadband internet connection to the Enphase Enlighten™ website. The Enphase Enlighten website analyzes the per-module data collected by each Micro-inverter. Enlighten automatically detects any shortfall in energy production, identifies possible causes, and suggests solutions to correct the problem. The Enphase Enlighten website is constantly monitoring and managing every module on every installation. Dimensions (WxHxD) in inches 7.75" x 5" x 2.38"
This item normally ships in approximately 1 week or less.